Healthy U participants try out yoga poses with instructor Kiamsha Leeke on June 9, 2012. Photo by Lucia Effros. Westminster Presbyterian Church hosted a series of wellness workshops for the entire Southwest community this June. The free series, coordinated by Smith Center for Healing and the Arts, included a “Wellness Works!” kick-off event followed by three “Healthy U” workshops on Fitness, Nutrition and Stress Management. 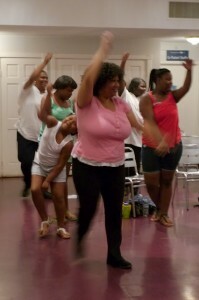 Healthy U participants exercise with instructor Rodney Jordan on June 9, 2012. Photo by Lucia Effros. 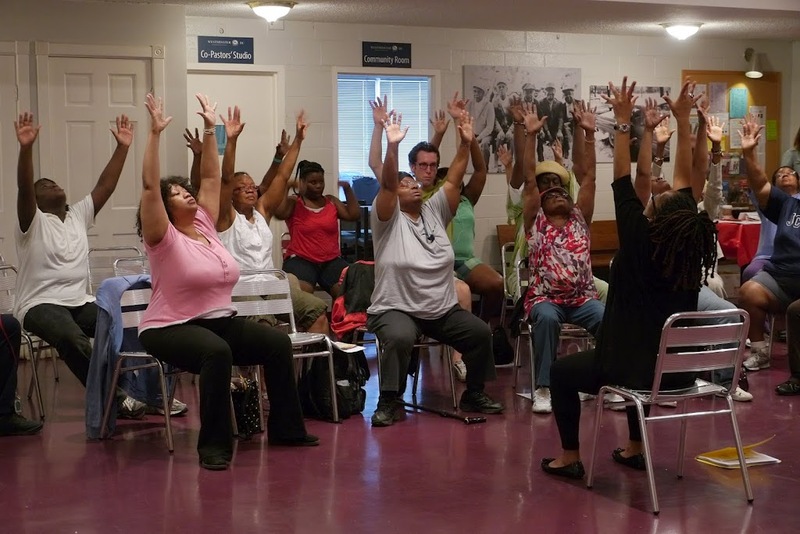 Over 90 people took part in the Third Annual Wellness Works/Healthy U series, picking up tips for staying healthy in mind, body and spirit through interactive presentations by some of the DC area’s leading health professionals. The kick-off event on June 2 featured a powerful presentation on the health risks we currently struggle with as a nation, and in particular those faced by African-Americans. Guest speakers Drs. Marilyn Hughes-Gaston and Gayle K. Porter of the Gaston and Porter Health Improvement Center, Inc. captivated the audience with their inspirational call to action, challenging everyone to truly take charge of their own health. The energetic, positive atmosphere created by the keynote speech was sustained throughout the rest of the kick-off event as participants sampled fiber-filled smoothies, laughed and sweated their way through an upbeat exercise routine, and experimented with breathing and imagery techniques for stress management. Presenters for each of the Healthy U workshops on the following three Saturdays in June took the time to explore their topics of expertise in greater depth, helping participants from 9 to over 80 years old try out yoga, healthier versions of favorite soul food recipes, and ways to monitor and relieve patterns of stress in their daily lives. 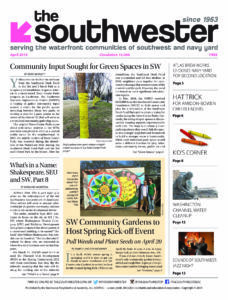 In addition to a significant turnout from the neighborhood, the series was supported by volunteers and members from the Southwest Neighborhood Assembly as well as the World Bank-International Monetary Fund Staff African-American Association. Smith Center for Healing and the Arts advocates for an integrative approach to health and wholeness for all people, combining the best of conventional and complementary health care for optimal wellness, prevention of illness, and the best possible experience in life. Smith Center is a stand-alone cancer support center that remains dedicated to providing integrative health programs and resources for the D.C. community, offered year-round at the community center on U Street.